A mock air battle between an F-16 jet and the military’s new and oft-troubled F-35 stealth jet showed that the F-35 is too sluggish to hit an enemy plane or dodge gunfire, according to a report. The F-35 has cost the US military more than a trillion dollars since work on it began, making it the most expensive weapon in history. The mock air battle, staged in January over the Pacific Ocean, was to test the F-35’s prowess as a close-range dogfighter at 10,000 to 30,000 feet. The F-35 pilot was to fly his jet hard, turning and maneuvering to “shoot down” the older F-16 jet, whose pilot would be doing his best to evade being hit, and trying to attack the F-35. The F-35 was designed to far exceed the fourth generation F-16 jets, first built in the 1970s, with the ability to carry its fuel and weapons internally. Yet aerodynamic problems, such as “insufficient pitch rate” for the jet’s nose while climbing, were reported during the mock battle. The F-35 test pilot also discovered he couldn’t comfortably move his head inside the jet’s cramped cockpit. “The helmet was too large for the space inside the canopy to adequately see behind the aircraft,” said the report. That allowed the F-16 to sneak up on him. The F-35 pilot tried to target the F-16 with the stealth jet’s 25-millimeter cannon, which the smaller F-16 easily dodged. The pilot said the F-35 performed so dismally that it had no place fighting other aircraft within visual range. In one maneuver, the F-35 was able to perform decently at rudder reversal at slow speeds, but this used a lot of the aircraft’s energy, leaving the aircraft vulnerable to attack. The brief release to the War is Boring website was unclassified but still marked “for official use only.” It documented a mock battle taking place on January 14, 2015 over a sea test range in the Pacific Ocean near Edwards Air Force Base, California. 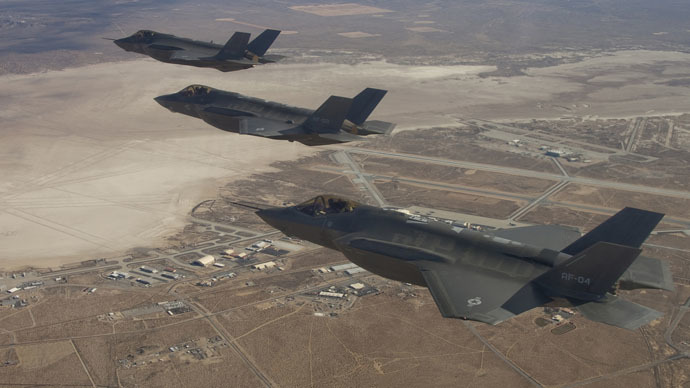 There have been reports of fundamental problems with the F-35, which was designed by Lockheed Martin, as well as complaints about the ballooning cost of the project. In April, Congress learned the software system for maintaining the fighter jet was giving false-positive readings 80 percent of the time, possibly leading to even more development delays. Turner told Congress that ALIS doesn’t have a spell checker and raised concerns about the software’s ability to catch errors worse than grammatical ones. The current ALIS system is held in place by computer racks and weighs 800-1,000 pounds, making it cumbersome in combat environments. A smaller, two-man portable version is being developed which is due to be ready in July. Last year, the Government Accountability Office found the ALIS had failed to meet basic requirements like identifying faults and failures. Earlier news reports stated that a computer glitch had kept the aircraft’s four-barrel rotary cannon from firing, potentially delaying the jet from being fully operational until 2019.